Everyone is an expert when it comes to the market, or at least a certified psychic. Everyone seems to think they know what’s supposed to happen, especially if you read the articles around the web and the newspapers on the stand. You know what I think: Talking heads are useless! Why don’t we just sit back and allow the market to tell us where it wants to go. 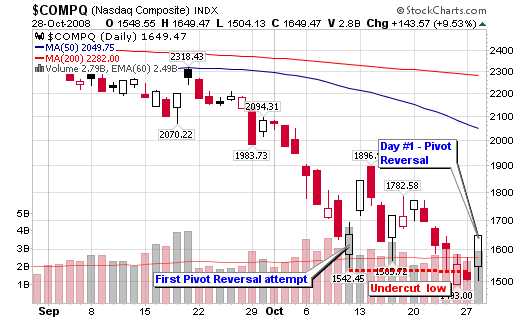 I can’t say that expected the market to rally more than 10% or almost 900 points the exact morning I post the parameters to a pivot reversal (the article was written Monday night while watching the Titans smack around the Colts). In any event, the market clearly marked day one of the attempted rally. No argument here. Is it too early? Should we wait on the sidelines? Should we wait for the election? Are you scared to trade? Are you scared to lose? Are you embarrassed to be wrong? 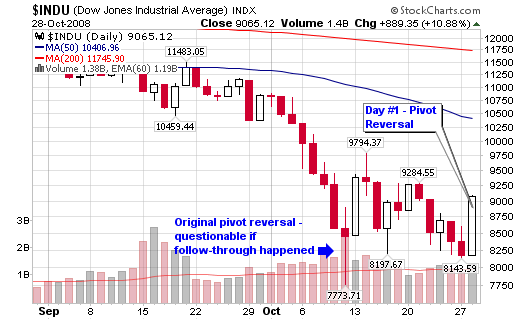 Rule #1: Wait for a follow-through on overwhelming volume, 4-10 days from today’s 10% surge. The signal will be “buy” if we get a follow-through, so add a few shares at that time. Maybe it will reverse but we can’t think to hard about rules etched in stone, so we can only act based on the historical odds presented by this scenario. Trade small; enter a position that is 1/3 or 1/2 of your regular position size or trade fewer units but don’t sit on the sideline because you “think” this is a false move. As I said yesterday, 20% of all moves that provide a pivot and a follow-through will fail so we do have a 1-in-5 chance of witnessing a head-fake. But that also means that we have a 4-in-5 chance that a rally can form if we get a follow-though starting this Friday and lasting until Monday, November 10, 2008 (day 10). I’ll admit, I have many biased views on this market and it is will take a lot of courage for me to pull the trigger but I must clear my head and follow the tape, follow the price action and most of all, follow the rules. I don’t consider this a follow-through because we have exited the 4-10 day follow-through period and the market has trended lower with distribution days. 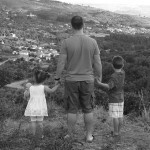 Today is day 1 in my book, for purposes of analysis on this blog. When does a rally attempt end? A rally ends when an index such as the Dow or NASDAQ undercuts the rally’s low. The count will restart from 1 when the next pivot reversal appears. Don’t rush to buy stocks after a prolonged down period because stocks with quality bases will be difficult to find and they will lack ideal accumulation or entry points. Build a watch list instead. My watch list is slim because it’s very difficult to find quality candidates at this time. The best method in my mind is to look for stocks with strong relative strength ratings that are trading above their 200-day moving average. So, let’s sit and wait to see if we get a follow-through four to ten days from Tuesday. Can you please e-mail me to explain why you are deleting my comments. I am not sure if you think I am a spammer, but I congratulated you on your wife being pregnant and both comments were deleted. I’m just confused and want to make sure I didn’t do anything to offend anyone. I responded to you in private e-mail. Can you also look at a few non-US markets (a) a European index and a (b) an emerging market index? It’s very possible that a non-US market may lead the way. I can take a look this weekend but do understand that I trade the American markets so I don’t focus too much elsewhere, except from a macro perspective to gauge world health from time to time. It’s not that important in my trading. I must say, that I could not agree with you in 100%, but that’s just my opinion, which could be wrong.